Owning horses is a satisfying but demanding experience. For all their size and strength, horses can be very fragile creatures that need a great deal of care. Show horses, in particular, need shielding from the elements and a protected area to spend most of their time. 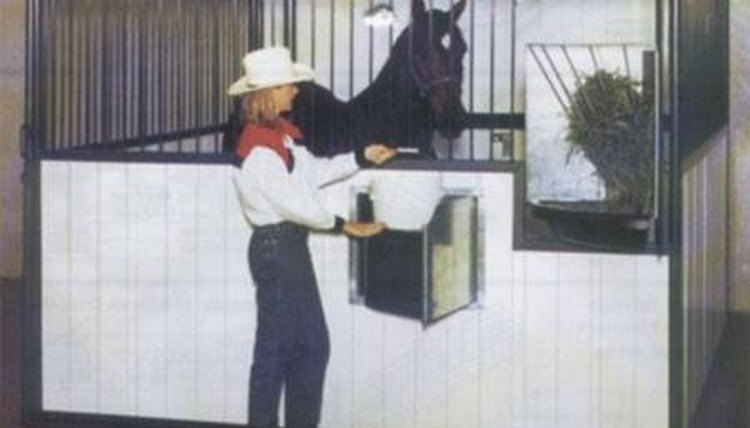 Stalls are a necessity for many horse owners. Building a stall is complex task requiring some construction experience. The more of the process you understand, the better your planning, decision making and purchasing will be. Choose what type of stall you want to build. There are many types of stalls. Some come in ready made kits. Other stalls are built from scratch from lumber and the blueprints formed in the mind of the builder. Decide on which type of stall you want and then purchase either the kit, or the materials you will need to complete the project. Measure your materials. Stalls generally come in a 12-by-12 foot size, but can come in 10-by-10 foot, or 24-by-24 foot, or--in the case of a custom stall--in any size the builder chooses. Ideally, you should have no more than 12 feet between brace posts, as lumber any longer than this can be too weak to support the abuse a horse can inflict. Frame your stall. In the case of kits, this is the part that is generally done for you. In metal kits, you will use screws to put the frames together. In wooden stalls, you will sink the brace posts at least 18 inches down in the ground and set them in concrete. Then you will screw in your wooden framework to the brace posts. Fill in your walls with lumber. Even in stall kits, this is where you will need to have pre-measured lumber and fill in the spaces between the brace posts and corners of the stall. In kits, it will be a matter of sliding the lumber into pre-set channels. In custom wooden stalls, you will need to hammer, screw, or bolt your lumber to the framework of the stall itself. Finish with adding eighteen inches of clean sand which will serve as your base for whatever bedding you choose to add to your stall. Some people will choose to cover the sand with a stall pad made of rubber or neoprene. Always use the best material you can afford and take your time with construction. Doing the job well and once is far better than constantly having to repair a job poorly done. Always follow the instructions given on any power tools and use safety goggles or other precautions when necessary.